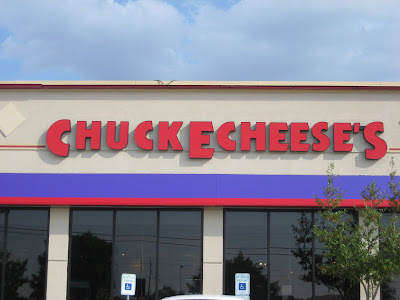 Well, it is official folks--- The May children have finally visited "The Cheese". It is actually quite shocking that we made it this long. 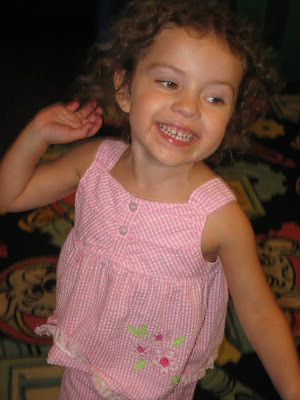 We almost went there last March for our niece's birthday but the birthday location changed last minute. Friday night was a little bit cloudy and so we took a chance with some indoor chaos...er, I mean fun. 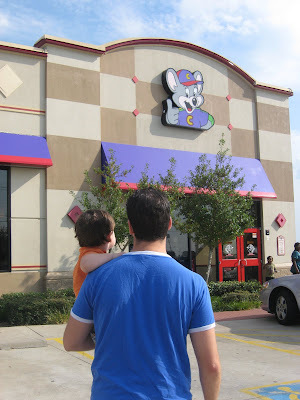 We did shamefully venture out to Rockwall's Chuckie Cheese because for some reason we imagined that it would be cleaner, newer maybe and perhaps a bit less crowded. Dallas is big and dirty, you know. Insert the theme song of Jaws. Kelly and I may have been a bit terrified but not the May children! They were in HEAVEN. 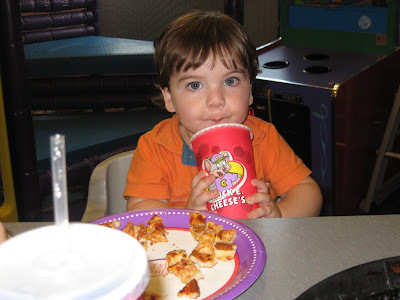 Pizza infused, kid chaotic, tubes-on-the-ceiling heaven. Molly initially kept telling me that she wanted to see the "Bear" aka Chuckie. I informed her that Chuckie was actually a mouse. Kelly then took this opportunity to explain that originally back in the day of Showbiz the mascot was a bear. I think that Molly was over at the skeeball tables by the time he finished. Oh, the priceless history kids today take for granted! It may have been busy but we really did have fun. 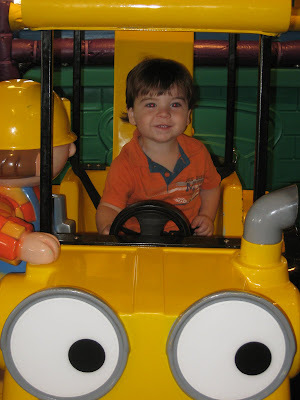 Bob the builder was Gabe's ride of choice. I think he tapped out at about 11 rides and one kiss fest with a plastic bob character. LOVE. Another love was drinking pink lemonade out of BIG cups. Molly was convinced she was really drinking coke. I shudder to think what a Molly with caffeine would look like. Wow. I never realized how salty the pizza was. We were drinking water all night long. It was yummy though at the time--- perhaps a bit sauce-less. I will save the full review for my friend, Heather. There were two little catastrophes but we muscled through them. First of all, we might have lost Molly for about 45 seconds. She was up in the tube and just never came down the slide... apparently, she went exploring. 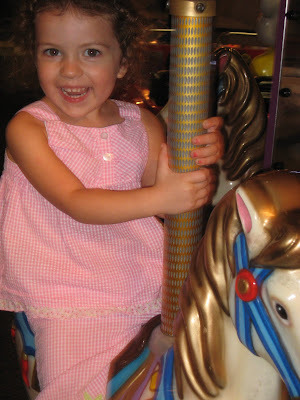 We quickly recovered and hit up the carousel for about 9 laps. Molly just might be the biggest carousel nut out there. 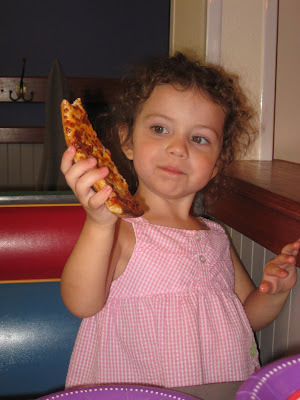 Well, seconded only to her Papa John. Gabriel was quite taken with Molly's adventure in the tubes. VERY TAKEN INDEED. So, while Molly and I were over at the carousel and Kelly was completely immersed watching this kid play the whack-a-mole, Gabe sought his opportunity to check the tubes out for himself. It may have not been Kelly's finest parenting moment but we will cut him a little slack because the whack-a-mole kid was a bit intense and definitely distracting. And here you have our nice little mini-melt. About 2 seconds later, Kelly looks down and can't find Gabriel. 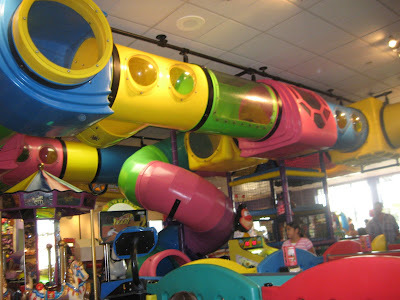 He had apparently mountain climbed up the slide and was living in tube land. Did I mention that tube land is on the CEILING? A little coaxing, some frantic pacing and an almost daddy climb to the ceiling later, Gabe was back on the ground. And we were heading for home. It was a bit of chaotic moment but it ended with HUGE prize. Molly's pink plastic fish that cost 10 tickets. Her beloved. 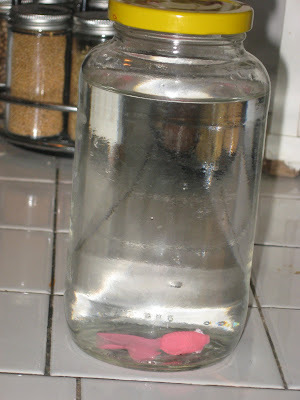 At home the fish was quickly placed in water because a fish can't live without it...duh. According to Molly her fish swims around only when she is sleeping. Sounds good to me- as long as we don't try to feed it. Such an adventurous start to the holiday weekend!